Since I have been cleaning piles and piles of data at work and freaking out by all the disorganization (no one's fault, just too many cooks in the kitchen), I decided to make my blog more streamlined. I am going to figure out how to change the color (orange isn't my favorite color) and make it a bit more me. I hope you like it so far. :) If I get tons of protesting, I will change it back, but give the streamline-ness a chance to grow on you! While I was going through the piles of data for the Hepatitis C study, I found myself listening to the opening sequence for Trainspotting. I thought this was a perfect monologue to listen to while cleaning data on heroin users. After listening to the "Choose Life" sequence a couple of more times, I realized that this speech could work well for knitting and since I am getting pumped for the Amazing Lace, it has a lace theme! Note: This is a family-friendly version. If you are interested in the real version, know that the language is rough. Choose lace. Choose a pattern. Choose a knitting needle. Choose a yarn. Choose a freaking big chart, choose Eucalan wash, Addi Turbos, Chibi tapestry needles and cachachas. Choose good designs, with few errors, and an email address. Choose reasonably priced local yarn stores. Choose a starter project. Choose your blogger buddies. Choose shells and cotton tanks. Choose Jaggerspun Zephyr in a range of freaking colors. Choose designer patterns and wondering who made the unintelligible pattern at two in the morning. Choose sitting on that couch watching reality television and crime shows, for just one more row. Choose collecting yarn, filling your house with it, knitting hats and mittens for your family and friends. Choose your future. Choose lace. Okay, I am on a slight kick, since I bought yarn last night supposedly for the Folk Shawls' Sampler Shawl. I am not sure if I got the right weight, so I am going to make whatever the yarn tells me. Yes, I know finding a yarn substitute should be easy, but I started thinking way to hard about it. I should also confess (Mom, I am really sorry about this, I don't know why I am apologizing to you, but I see the frown on your face from here) that I bought a swift and a ball winder too. I had coupons! The yarn I bought for the shawl needs to be wound! It is a good investment. Really, it is. Wow, I can't believe how much guilt this purchase is causing me. When I get my fun packages in the mail I will have pictures and then you will all see how I could not say no to the yarn or to the swift and the winder. Besides thinking about knitting and changing my blog, I have been knitting! I finished another dish cloth. Okay, I do need to weave in the ends, but I am going to do that tonight. 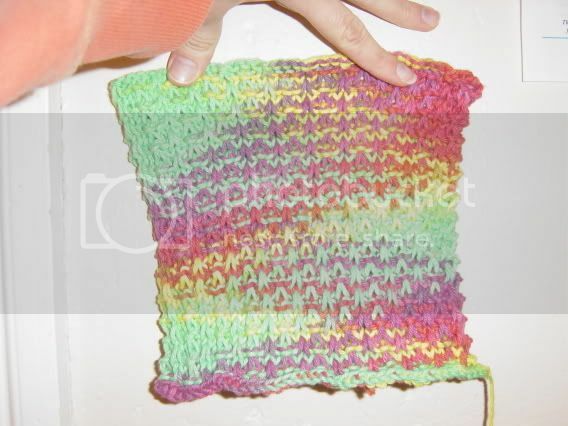 I am really enjoy knitting these dish cloths. I have been trying out all sorts of new stitch patterns that I might not have tried. Plus, I am being a good knitter and writing down any important notes about the stitch like whether it is stretchy and if the "swatch" curls or not. 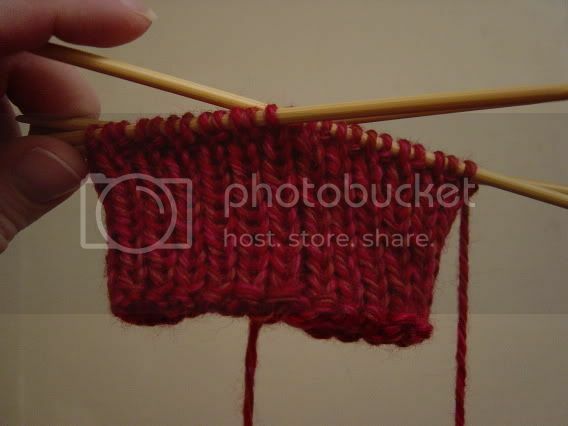 I havent't gotten too far on my sock recently, but I am going to finish the cuff tonight, probably while watching Leno and Conan. ;) I am going to Gainesville, FL with my parents later this week and I have been spending my free time running errands. At least I will have some uninterruptable knitting time on my flight to Orlando! And have a good trip to Fl. Keep up the lace enthusiasm! I like it! And don't worry too much about the winder and swift--just think how much time will be freed up for studying because you can wind yarn in minutes instead of hours. Oh wait, then you'll knit more.... Hm.